A landslip has blocked off the Ok Tedi mine access road following an earthquake that occurred in the early hours of yesterday morning (Monday 26th Feb, 2018). 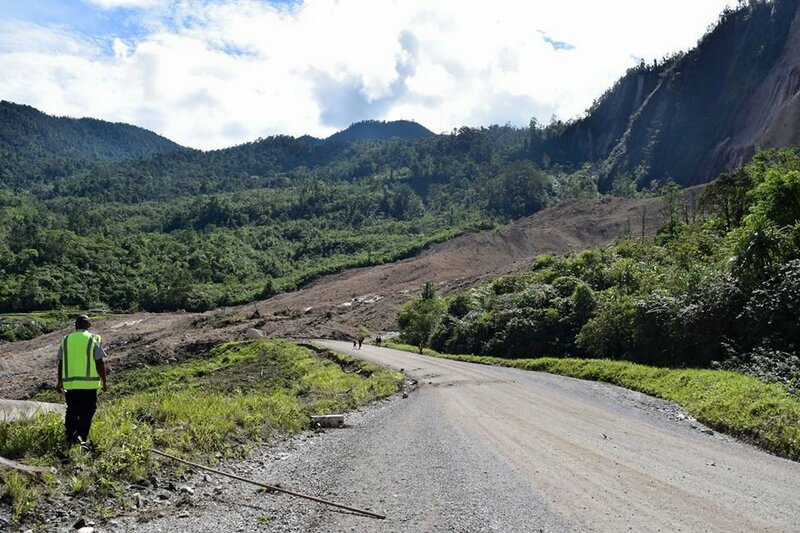 PNG's Ok Tedi Mining Limited (OTML) confirms that the landslip occurred on a section of the Tabubil – Mine road in Western Province. Employees who worked the night shift at the Mine and Mill have been relocated safely back to Tabubil by helicopter, with all employees accounted for. The landslip damaged the water and concentrate pipelines at the slip location. Maintenance work on the damaged pipes will begin as soon as road access is restored and spare pipes are transported to the location. Managing Director and CEO Peter Graham said no damages have been reported at the Mill and Mine or in Tabubil Township, however the nearby Bultem Village has lost power and options for restoring power to the village are being evaluated. Early estimates are that it will take at least several days to clear the road to allow for normal traffic flow. Clearance will commence Tuesday morning under strict safety provisions. In the meantime a skeleton crew will maintain inspections at the mill and mine. The highway between Tabubil and Kiunga has also suffered from a number of smaller landslips and cracks, limiting access to light vehicles only.